Sets in Mejiro, Tokyo. Members are all high-grade flutists, including both professional and amateur players. 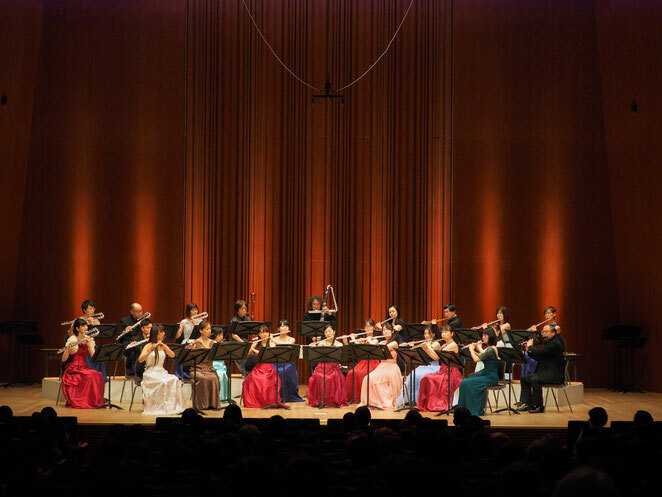 A flute orchestra who plays mainly classical music, especially actual orchestra pieces only by the flutes. 2 monthly practice sessions with condensed contents pursuing of music. Our motto: Be a human before being a flutist. The words were given by our late musical consultant, Mr. Yoshio Saito, one of the greatest flutists in Japan and a respected teacher. Regardless professional or amateur, members are required to have 'ensemble mind and ensemble action' and keep this words in our mind. We always seek any opportunity to pass our gift of music. Any offer or request of playing is always welcome!